Drawing on extensive clinical experience, Richard G. Moore and Anne Garland present a cognitive model of persistent depression that places particular importance on the role of thinking styles, underlying beliefs, subtle forms of avoidance and environmental factors. 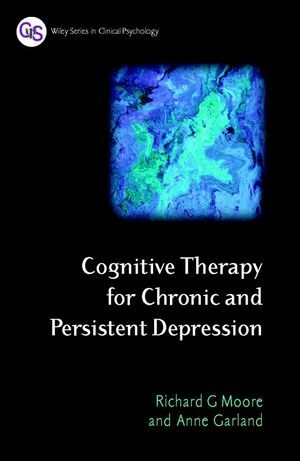 Through extensive clinical material, Cognitive Therapy for Chronic and Persistent Depression demonstrates how entrenched negative thinking patterns and ongoing avoidance can be addressed to achieve significant change in many people’s lives. This book is essential reading for any therapist working with these hard to help patients, such as clinical psychologists, psychiatric nurses, psychiatrists, social workers and counsellors. Richard Moore works as a clinical psychologist in the Department of Cognitive and Behavioural Psychotherapies at Addenbrooke's Hospital in Cambridge. After obtaining an M.A. and a PhD. from the University of Cambridge and completing his clinical psychology training at the University of Edinburgh, he trained as a cognitive therapist at the Center for Cognitive Therapy in Philadelphia. He has been a therapist on major controlled trials of cognitive therapy for recurrent and residual depression in Edinburgh and in Cambridge. He is a Founding Fellow of the Academy of Cognitive Therapy. Anne Garland is a nurse consultant in psychological therapies at the Nottingham Psychotherapy Unit. After training in cognitive therapy at Sheffield and Oxford, Anne worked as a therapist in two Medical Research Council funded trails investigating the efficacy of using cognitive therapy in the treatment of residual depression and bi-polar disorder. She has developed clinical expertise in the delivery of cognitive therapy across NHS service settings including primary care, community mental health teams, inpatient units and specialist psychotherapy services. She is currently President-elect to the British Association of Behavioural and Cognitive Psychotherapies (BABCP) as a member of the psychotherapy accreditation sub-committee. Introduction: The Challenge of Persistent Depression. Chapter 1: The Cognitive Model of Persistent Depression. Chapter 2: The Foundations of Therapy: Therapeutic Relationship, Style and Structure. Chapter 3: Initial Assessment and Formulation. Chapter 4: Initiating Therapy: Socialisation and Setting Goals. Chapter 5: Using Standard Behavioural Techniques. Chapter 6: Working with Automatic Thoughts. Chapter 7: Recognising Underlying Beliefs and Their Effects. Chapter 8: Modifying Underlying Beliefs. Chapter 9: Working with Some Typical Themes in Persistent Depression. Chapter 10: Beyond Therapy: Preventing Relapse and Furthering Progress. Chapter 12: Outcomes and Processes of Therapy. Appendix 1: Meet the Patients. Appendix 2: Handouts for Patients.